Well, GOOD MORNING! We are on now on the third day of our GMG Ephesians Bible study! I hope you are enjoying your time with the Lord in His Word! Isn’t it wonderful to purposefully sit with your Bible, reading and journaling a few verses at a time, looking at them slowly and carefully?! I love how this method allows me to truly meditate on the Scripture, letting it really sink in, as if to marinate my mind in the Word! Praying over these Scriptures during my quiet time, I have found myself this week, mostly thanking Him in my prayers! I am blessed with every spiritual blessing in Heavenly places! In Christ, I am chosen, before Creation, to be blameless and holy before God! It pleased God to adopt me, through Jesus Christ! He has freely bestowed His grace on me! 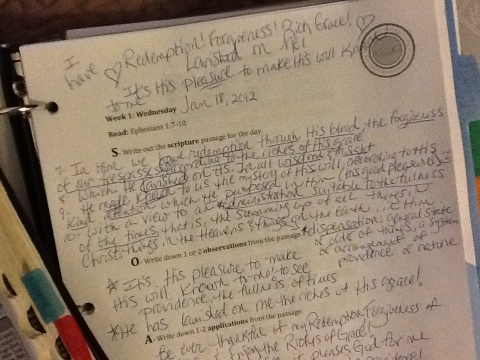 In Christ I have Redemption, Forgiveness and the Richness of God’s Grace is LAVISHED on me! It is His pleasure to make His will, His Sovereignty, His Providence in Heaven and on earth known to me! Wow, as I have read and meditated on these passages, there is no denying that GOD LOVES ME! He has always intended (before time began!) to make me His daughter, care for me, provide for me, have a personal relationship with me, to give me freedom from my sin and lavish His rich, full grace upon me! It is His good pleasure, His kind intention!!! Amazing! What a blessing to share now with all our readers! What special thing have you received these past few days in Ephesians? Let’s weekly encourage and cheer one another on in The Lord! Be a part. Your words, no matter how few, may be exactly what someone needs to read! God bless each and every one of you as we continue on! I am praying for you! I am so loving this bible study. I find myself meditating on the verses throughout my day. This week has been a hectic week for us but I determined in my heart to do this bible study. I have read Ephesians many times & thought I read it thoroughly. Meditating on just a few verses at a time has allowed me to focus more on the meaning of these precious promises. Thank you for sharing Good Morning Girls site with all of us. God Bless…… & see you at the finish line. I just had to mention one thing that popped out at me. In the first few verses it talks about God’s will and intentions for us being good, but (at least in the NASB, vs 5 & 9) it uses the term “kind intentions” a couple times. God has kind intentions toward us. As a mother, this really jumped out at me. I always have the best intentions for my kids, but are they always kind? Sometimes we can do the right thing but in an unkind way. I’m so thankful, though, that the grace of God is abundant and this passage sprinkled that in here multiple times as well. Praise God.